I guess you noticed that I have not been sharing any Project 365 layouts here lately it's because I have so limited time to scrap. 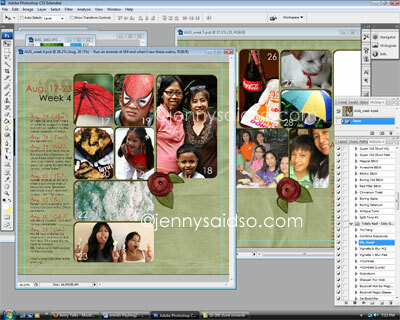 Finally today, i thought of updating my layouts so that I will not be too late or else I will end up left behind. I will not stop my photo a day even though there are days that I almost forgot to take a photo. Here's my layout for August Week 4-5, I used Shabby Miss Jen's template so it's making my scrapping a lot easier. I hope I can update my September once again soon. I can't wait to have it printed over at Artscow. Anyway, I will try to whip a new layout right after I watch a movie here at my laptop. Ahhh ...wish I had a bluray, I guess it would have been more nice.